Wikipedia has the following definition: Hitchhiking (also known as thumbing or hitching) is a means of transportation that is gained by asking people, usually strangers, for a ride in their automobile or other road vehicle. Hitchhiking can be free or paid. In most cases you may not be even dropped to your actual destination; usually it will be some major town/village midway from where you may get a proper ride. Hitchhiking can be a pretty enlightening experience for an intrepid traveler: anyone stuck with a co-traveler with a story to tell can relate here. I have grown quite accustomed to hitchhiking as a part of my travel, for Mask or otherwise. Anyways, dedicating this post to some of my hitchhiking experiences and a few pointers on how to bag that ride! 1: Hitchhiking on the back of a pick-up/tempo/goods-carrier: One of the most typical forms of lifts available on the highway. Usually will charge a nominal amount. Stretching out in the cargo section can be very relaxing, although sometimes you are better off standing if the condition of the floor demands so. Cross your fingers though, they can often ride rough! 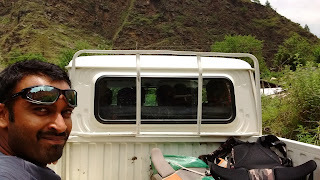 2: Hitchhiking in the cabin of a cargo vehicle: You seriously don't know how many people can be crammed inside a cabin of any cargo vehicle; be it a simple pick-up or a big dumper, there is always room for more! Indulging in a bit of small talk with the driver can be quite fun. However, it is advisable not to doze off here. 3: Hitchhiking in a car: Unfortunately, I've no experience in this category of vehicles. Known to be very comfortable. 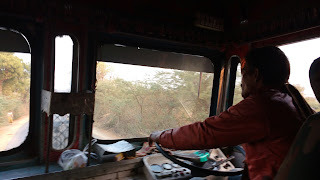 4: Hitchhiking in a bus: This is always a paid transport with nominal rates. But be prepared for a thorough interrogation of your visit, your purpose of travel, reasons for missing the last public bus, your occupation, religion, cast, creed, family ... everything! 5: Hitchhiking in a tractor: Sounds strange, but yes, these powerful crawlers do accept hitchhikers. This is going to be one hell of a jerky ride with the possibility of your great fall if you don't hold tight. 6: Hitchhiking with train staff: Travelling without a ticket is passe. 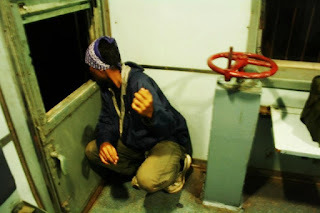 Hitchhiking in a train means you will be treated as a guest on-board! You need to be damn lucky to get these ... seriously lucky! 7: Hitchhiking on a bike: Bikers are usually helpful and plentiful too. 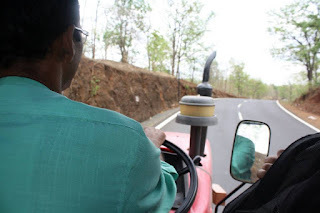 Be prepared to ride triple-seat singing along to 'Yuhi Chala Chal'..
1: The action: Extend your left hand with the thumb pointing towards the direction you want to go. Any other action (waving of hands over the head, the taxi flag-down gesture, shouting) are considered thoroughly inappropriate and will usually not work. 2: The position: On the edge of the road, without in any way interfering with the vehicle's path. Left foot on the road, right foot off the road. Anywhere closer to the middle and you will end up being knocked over or annoying the driver. Anywhere farther, you risk being invisible to the driver. 3: Number of passengers: Always try to indicate the number of passengers with you. Basic finger symbols work here. 4: Be at ease: Always have an easy demeanour while asking for a lift. Don't be too aggressive on the driver. Also, don't appear desperate. 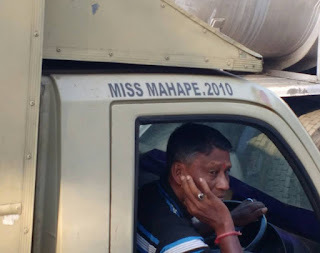 Remember that you are requesting for a lift, not demanding one. 5: Eye-contact: Maintaining eye-contact is essential. 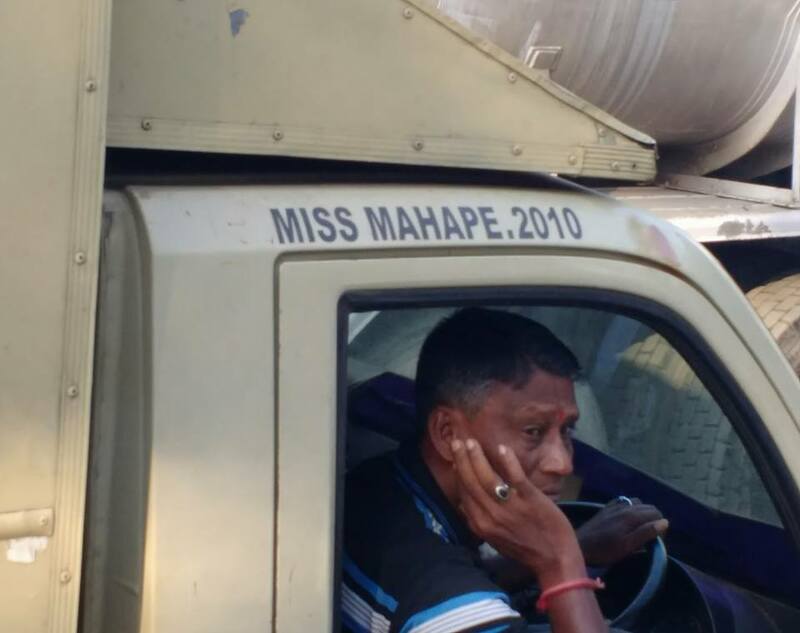 It will tell you if the driver is interested in offering a ride. Uninterested people will usually look away. No attempt to make an eye-contact from your side also means that you are not seriously interested in the ride. This may deter people who may genuinely want to help you. 6: Smile: Be a person who someone will like to have in their vehicle. Try to look like a bright company rather than a sour one. 7: Politeness: Do not be rude in any way to the driver. If you feel offended in any way, politely refuse the offer. 9: Patience: Lastly, be prepared to wait for hours to get a ride. Patience is the most values virtue in a hitchhiker. Patience will truly take you places and will shower those on the road experiences of a lifetime. 1: Do not consider hitchhiking as a viable option when traveling with a family or a large group. This activity is better restricted to hardy youth traveling in small groups. 2: Avoid resorting to hitchhiking after dark, especially in the interior, less accessible parts of the countryside. It is better to spend the night in the village nearby or spend some bucks for a private taxi. 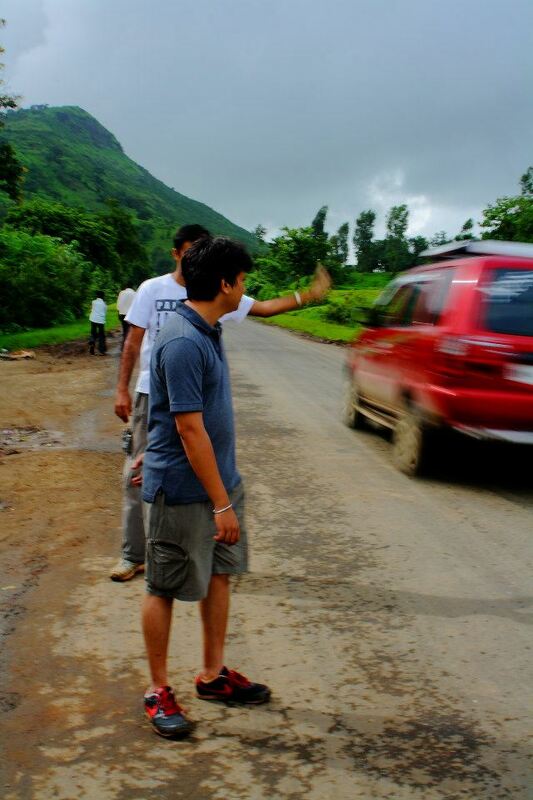 3: Hitchhiking is always the last resort during any travel. Although cheap, this is a very unreliable option of transport. The potential pitfalls (safety, reliability ...) will always outdo the merits. Don't let the romanticism fool you. Having your own ride is always more dignified than requesting (also read as begging) others for a ride. Adios! Thank you for reading. Do enjoy your hitchhiking!